We are an official MinnKota warranty repair center and carry a complete line up of MinnKota Motors, parts, accessories, props, rigging supplies and much more. We also have a complete line of deep cycle batteries and on-board charging systems to power your trolling motor. 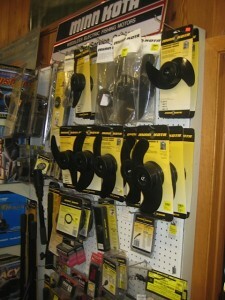 We carry some pre-owned transom mount and bowmount motors from MinnKota. We also professionally install trolling motors and can take care of all of your rigging needs. Please contact us for more information and for our current inventory.